Yes I know that this is the second Stash Note in a week but I am so so excited about this fabric that I cannot wait to show you any longer. Besides I have already cut into it so really need to show you before the quilt top is finished! This fat quarter here of the most gorgeous blue and white fabric is from Westfalenstoffe. Westfalenstoffe come from Germany actually but are sold all over. I bought this adorable bundle at the British Distributer of Westfalenstoffe and you can find the online shop here. Look at the detail of the pattern. My favourite are the chicken. 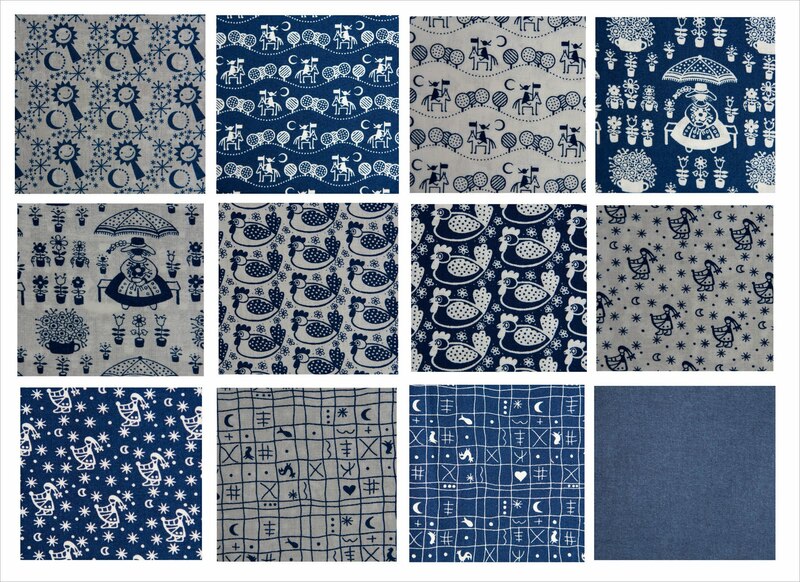 I am using this fabric in a new quilt together with other Westfalenfabric that I bought last year at my local shop Tikki Ltd. I already introduced this small fat quater bundle months ago but want to show it again as I finally found a purpose for it. These fabrics are actually woven fabrics and look just stunning. 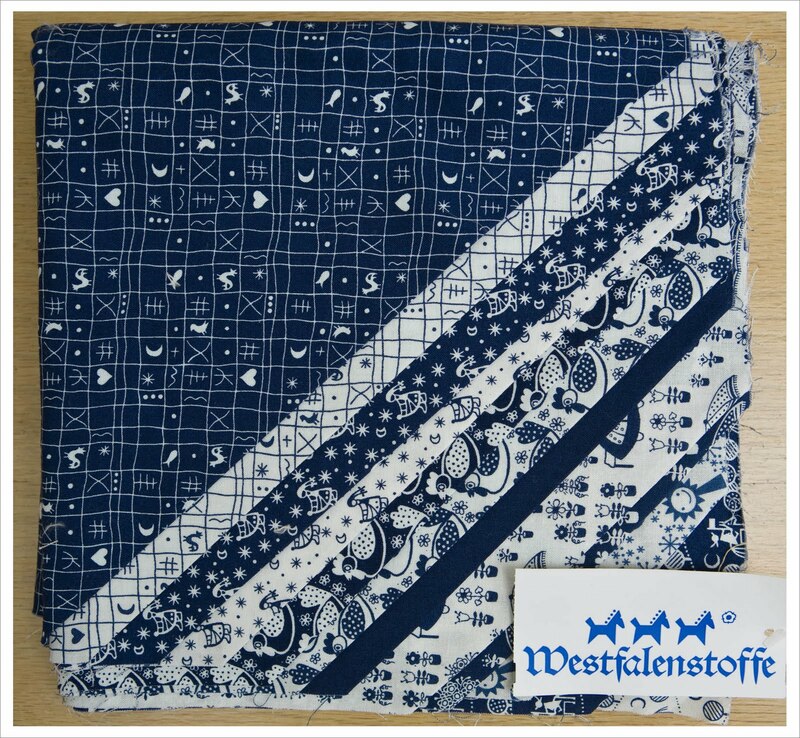 If you are interested in Westfalenstoffe then you can check out there German web page here. Don't worry there is a language button at the top left corner so you can switch to English. 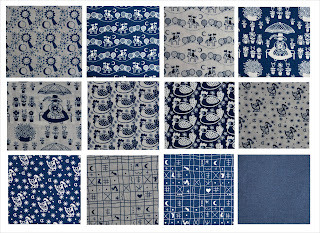 I think the UK distributers can order the fabric for you but you can also check out Tikki Ltd. I think I have some Westfalenstoffe fabric. Appropriate as I was in Duesseldorf for nine months - if it is made in the region? I shall have to check out the website...thanks. The wovens will go well with it. Looking forward to seeing what you do with it! Yum! 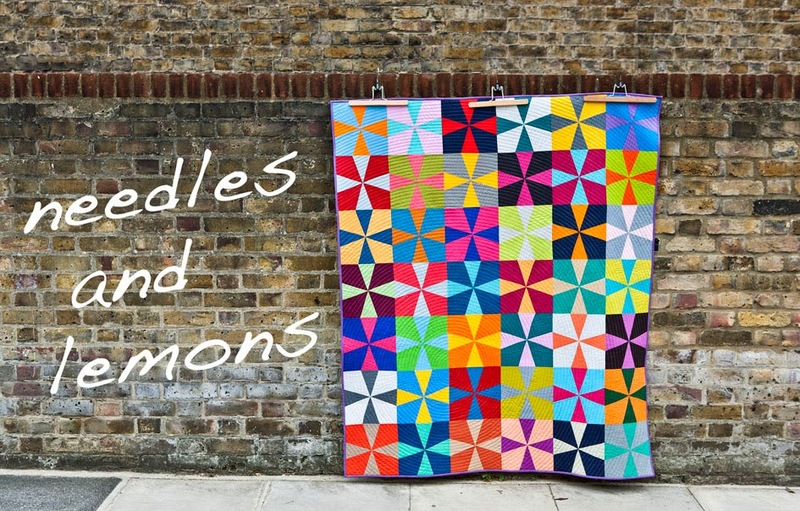 These will make a gorgeous quilt - can't wait to see it! I have a little red and white Westfalenstoffe fabric that will be particularly handy for Christmas projects (if I can remember where I put it). Gwen at celticfusionfabrics.com usually has some of these lovely prints too. Tikki is a great shop - the colours look wonderful together! looking forward to see what you make of these fabrics. I have something similar that I purchased in Amsterdam years ago. I think I want to combine it with some linen...but haven't decided on a plan quite yet. Pretty! The smiley sunshine/flower is my fave! Look forward to seeing what you do with them!